Home/Minerals/ASGCO® Engineering Helps East Coast Silica Manufacturer Streamline Their Processes. Solution: ASGCO® used a Cloud Point Laser Scanner to scan the area instead of taking field dimensions with hand tools, minimizing the margin for error and increasing accuracy. Then ASGCO® engineers used our 3-DEM™ chute analysis program to model a chute which would effectively transfer material between the two conveyors, while ensuring there would be no heavy impact or abrasion areas in the new chute. A Flo-Control™ chute was then fabricated at our Fabrication facility and then installed to transfer the material onto a cleated belt, eliminating the dryer completely. UHMW lining was placed inside of the chute to gave the chute better sliding capabilities and to prevent material from sticking to the chute and causing plugging. 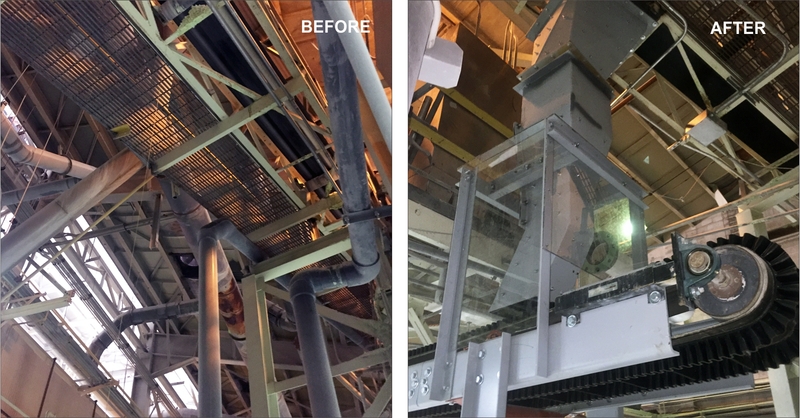 Results: The result of this project are a fully functioning transition including an ASGCO® engineered and fabricated flow control chute and load zone that exceeded the customers expectations in regards to quality, workmanship, and functionality. The customer was able to run product without any delays and it made for a seamless transition to their goal of bypassing a dryer with their product.